Driverless, electric, shared cars will revolutionize our transportation system. Three disruptive technologies will transform our transportation system. 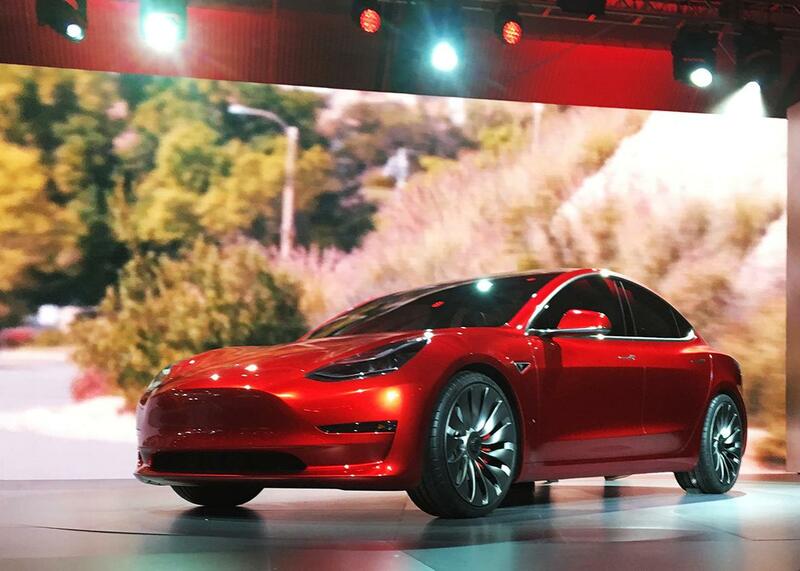 A Tesla Model 3 sedan, the company’s first car aimed at the mass market, displays during its launch in Hawthorne, California, on March 31. It’s been a good year for electric cars. Tesla’s Model 3 has logged almost 400,000 preorders, GM is ramping up production of its 200-mile range Chevy Bolt, battery costs are plunging, and sales in the EU, China, and U.S. markets are up sharply from this time last year. And yet, some of the most respected analysts in government and the private sector have gone on record stating that EVs are too expensive and impractical to compete with the standard automobile—not just today, but for decades to come. Exxon Mobil Corp., the Massachusetts Insitute of Technology, and the U.S. Department of Energy all agree that electric vehicles will remain a fringe technology for decades—until at least 2040. According to ExxonMobil’s crystal ball, electric cars will only comprise about 3 percent of the global automotive fleet by 2040. The U.S. Energy Information Administration is even more skeptical than Exxon Mobil, projecting that 2 percent of cars will be electric 25 years from now. MIT’s Sloan Automotive Laboratory only sees about 17 percent of new vehicles as plug-in EVs by 2050. But these shortcomings, as significant as they may be, pale in comparison to the biggest hole in the logic of gloomy projections: The explosive synergies between three critical disruptions that are poised to revolutionize our transportation system sooner than most think. Together, the rise of self-driving cars; transportation service providers like Lyft and Uber; and electrification will transform the economics of getting places, the importance of these technologies in our daily lives, and the pace and pattern for deployment of innovative technologies. To understand each one of these technologies, you need to analyze them together. Many modelers have missed this because they’ve done what they’ve always done: followed a formulaic approach. They add up yearly sales of new vehicles (in this case, electric), weigh that against how many other vehicles are junked and sold, and tally the result. And that’s worked all right in the past—all other things being equal, that formula should give you the relative percentage of electric cars on the world’s streets and their impact on future energy demand. But different kinds of cars will have very different impacts on the technology mix of the future. Take the first disruptor: new mobility. Companies like Uber are already blowing up assumptions about how cars are utilized. Traditionally, cars sold in America sit parked more than 95 percent of the time. (Think about that—what other major capital investment sits idle 20 times more than it’s used? Commercial aircraft, for example, have much higher utilization—nearly 50 percent.) But companies like Uber and Lyft (or Bla Bla Car in France, or Kakao Taxi in Korea) have been able to leverage these massive, underutilized capital investments (privately owned cars) through smart logistics, good phones, apps, and ubiquitous connectivity. Interestingly, putting underutilized cars to work wasn’t Uber’s original plan, but the logic behind it is so compelling that both Uber and Lyft, which started off in very different places, co-evolved to embrace essentially the same business model—together with other new mobility companies around the world. Better vehicle utilization is just the beginning. New technologies promise to propel this evolution even further by reducing costs and increasing operational efficiencies. Two costs dominate driving: gasoline and the driver. The driver is by far more important, which is why autonomy (the second disruptor) is going to be so important. He or she represents a huge yearly outlay in operating expenditures costing even more than the vehicle itself. You can pick up a used Toyota Prius for $15,000, but it would cost more like twice that much to hire a person to drive it. So even if the add-on cost of the technology to make new vehicles autonomous ends up being relatively expensive (say $15,000 on top of the purchase price), it will rapidly pay for itself. For practical purposes, this means that rideshare companies have all the incentive in the world to get humans out of the driver’s seat—and a robot into it. Of course, this is a very bad thing from the point of view of people making a living driving for these companies, but that’s hardly likely to outweigh the hard realities of business. So there’s a strong link between the first two disruptors. With autonomy entering the picture, the most logical next step is for mobility services to move away from using private cars owned by individual drivers, to fleet vehicles owned by a company. Uber has already started to sound out automakers to find one willing to supply it with a fleet of autonomous cars. According to one study, this would reduce the cost of an Uber ride by as much as 80 percent per mile. And who wouldn’t want to save 80 percent—especially during a surge? But the Ubers of the world won’t stop there. Once rideshare companies own fleets of autonomous vehicles that can be operated on an optimized schedule (since there won’t be a driver who needs to sleep and take coffee breaks), they will want to maximize the utilization of those vehicles and reduce their fuel costs. The easiest ways to do that are to run cars as often as possible and to put more people into a single car. We’re already seeing the latter, as Uber Pool and Lyft Line grow explosively (particularly in markets like China). By owning a fleet of vehicles, companies like Uber can optimize their design to make the carpooling experience significantly more comfortable, convenient, and attractive. The incentives are huge because every time Uber puts two people in a single car, they cut their capital costs by 50 percent. The company can incentivize pooling through lower cost or perhaps superior service. Even after automation and carpooling, there’s one more piece of low-hanging fruit available to fleet operators: electrification. As batteries have gotten cheaper, EV ranges have increased and the economic logic of electric vehicles has steadily improved. With gasoline prices in early June at $2.34 a gallon, according to the Department of Energy’s eGallon, an electric vehicle is still about 50 percent cheaper to fuel than a gasoline vehicle. If you could save even 20 percent a year on fuel, electrification would seem like a pretty good idea. But when gasoline costs 200 percent as much as electricity for fuel, it’s way more than that—it’s a business imperative. Right now, Uber and its competitors don’t own vehicles. They essentially rent the car and the driver. Today, that’s a great business model: Write apps, don’t own much capital, and you can be profitable very quickly. But somewhat counter intuitively, rideshare companies like Uber will make even more money owning capital assets—so long as they no longer have to rent an army of drivers. Modelers have failed to appreciate the powerful synergies of electrification, automation, and fleet transportation services. The ineluctable economic logic that results from their interaction will be the story of 21st century transportation. Any company that fails to see the world through this lens does so at their own peril. These economic forces, powerful as they are, will also be reinforced by government policy. Electrification, automation, and fleet services will likely have dramatic, positive consequences for greenhouse gas emissions, traffic safety, and the productivity of commuters. While there will be (serious) challenges related to job losses, cybersecurity and privacy, the net social-benefit logic will strongly encourage policymakers to help speed this transition along. In short: Autonomous vehicles fleets are going to dominate the roads of the not-too-distant future; those vehicles are going to be electric; and each autonomous vehicle will probably be utilized 5 to 20 times as much as a standard automobile today. So even if only a small portion of total cars sold were electric, car-bot fleets would have a dramatically disproportionate effect on the percentage of transportation served by electric vehicles. For the purposes of forecasts, that’s what matters. Approximately 90 percent of a vehicle’s lifetime emissions are from its operation. If we can swap dirty gasoline with clean electricity, emissions from cars may cease to be a significant factor in human health and climate change. No disrespect to Exxon Mobil, the Energy Information Administration, or MIT. This is just the kind of technological discontinuity that hits modelers in their blind spot. And that’s why they’ve got this one wrong.